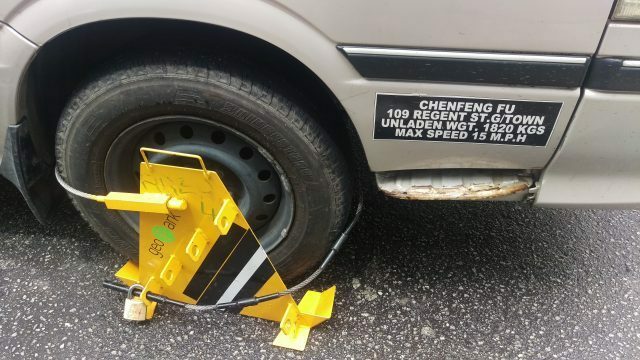 The minibus of a Chinese national was today clamped on Robb Street. The driver of the vehicle spoke very little English. Efforts have been made by court marshalls to serve Georgetown Mayor, Patricia Chase-Green, and Town Clerk, Royston King, personally with a temporary order to pave the way for the High Court to determine whether a parking meter agreement is illegal. With the booting (clamping) of motor vehicles still continuing despite the High Court’s order nisi, Attorney-at-Law, Kamal Ramkarran said he could not file contempt of court proceedings unless that order has been served personally on Chase-Green and King. He said the order was left with someone for them. Two court actions were brought against the parking meter regime. The first was brought by the New Building Society against the Minister of Communities, and the Georgetown Town Clerk, where the Minister must defend his approval of the parking meter bylaws, and further, why those bylaws should not be quashed by the Court. That matter has already come up in the Court of Justice Brassington Reynolds. 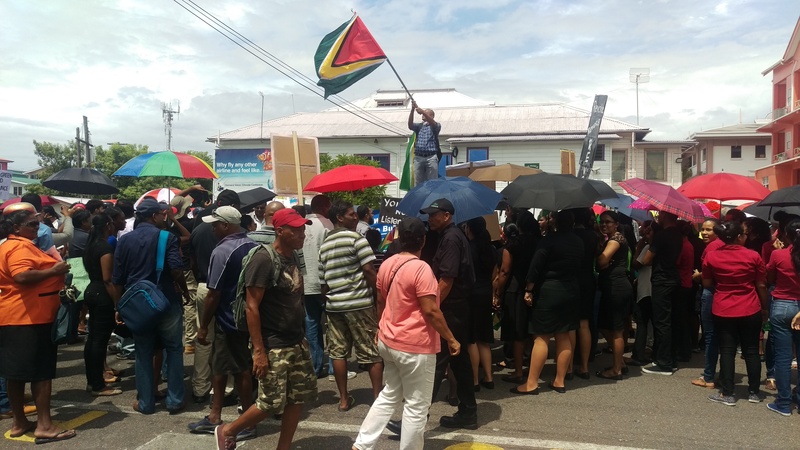 A new date has been set for affidavits of response to be filed by the Communities Minister, and the Georgetown Town Clerk against the Order Nisi. The second court action was brought by a private citizen, Mahendra Arjune, against the Georgetown Town Clerk and Georgetown Mayor. That matter is set to come up next Monday. A High Court order had been issued for both the Town Clerk and Mayor to defend the project in court. Attorney Kamal Ramkarran, representing Arjune, told Demerara Waves Online News that an Order Nisi acts as a stay against whatever action is being called into question from a public agency, being the Georgetown municipality. Ramkarran said the order, issued by a Judge, prevents clamping of vehicles and penalties for motorists under the parking meter regime. 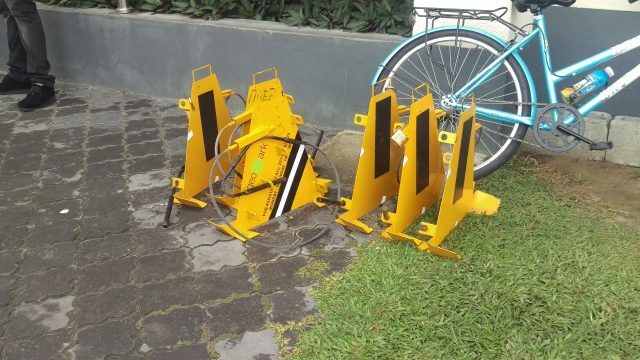 Smart City Solutions staff converged today at the corner of Robb and Camp Streets with a number of immobilisation clamps in their presence. Ramkarran said he would have to wait until the matter comes up before Justice Reynolds next Monday before he raises concerns about contempt. The attorney said he hopes Justice Reynolds would be in his favour, and asks that the Mayor and Town Clerk or their representatives appear in court. Protest action organised by the Movement Against Parking Meters (MAPM) continued today outside City Hall. Georgetown Mayor Chase-Green announced last week that despite the two pending court orders, the project would resume this Monday. Protests against the parking meters continued on Wednesday as the City Council was set to hold an extraordinary statutory meeting to discuss the new bylaws for the project, which would see a number of adjusted penalties and implementation measures including a 50% reduction in original rates for motorists parked 8 hours or more. An attempt was made to reach the Mayor and the Town Clerk at City Hall today but staff attached to both their offices said they were in meetings. In the mayor’s office, her secretary told Demerara Waves the Mayor was attending a meeting at the Communities Ministry, but a check with the Mayor’s driver revealed she had not left the compound.